Reinforcement activities for basic skills! Help is here for the student who needs extra practice with basic skills, for the accelerated student who enjoys an extra challenge, and for the young learner who is developing basic concepts and readiness skills. These inexpensive booklets boost self-confidence and reinforce basic skills with activities that are geared to a specific grade level. Packed with fun-to-do activities and appealing art to motivate students. Answer keys are included where needed. For individual use in the classroom or as homework. Reproducible. Compact 7" x 9" (18cm x 23cm). 56 pp. 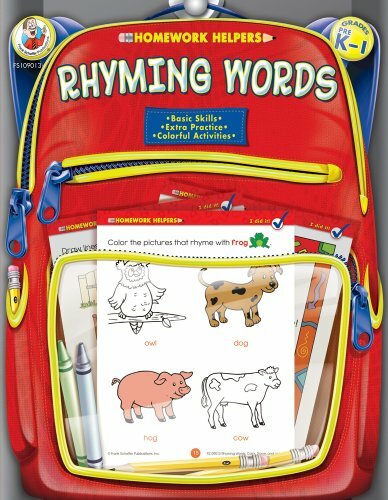 Rhyming Words Homework Helper provides children in preschool to grade 1 with extra help in learning basic word skills. Packed full of fun-to-do activities and appealing art, children will have fun completing the reproducible pages and learning rhyming word skills at the same time. Answer keys are also included where needed. --Our cost-effective Homework Helpers workbooks are a must-have! They provide help for students who need extra practice with basic skills, for the accelerated student who enjoys an extra challenge, and for the young learner who is developing basic concepts and readiness skills. They also help boost self-confidence and reinforce basic skills with activities that are geared to the specific grade level. Collect all 48 titles for preschool to grade 3 covering topics such as the alphabet, numbers, shapes, phonics, math, reading comprehension, and much more!